Department of Environmental Engineering for Symbiosis, Faculty of Engineering, Soka University, Tokyo, Japan. Received June 16th, 2011; revised July 12th, 2011; accepted July 25th, 2011.
treatment has been studied as a new approach [9,10-15]. perature until high hydrostatic pressure treatment. mined by counting the number of germinated seeds. 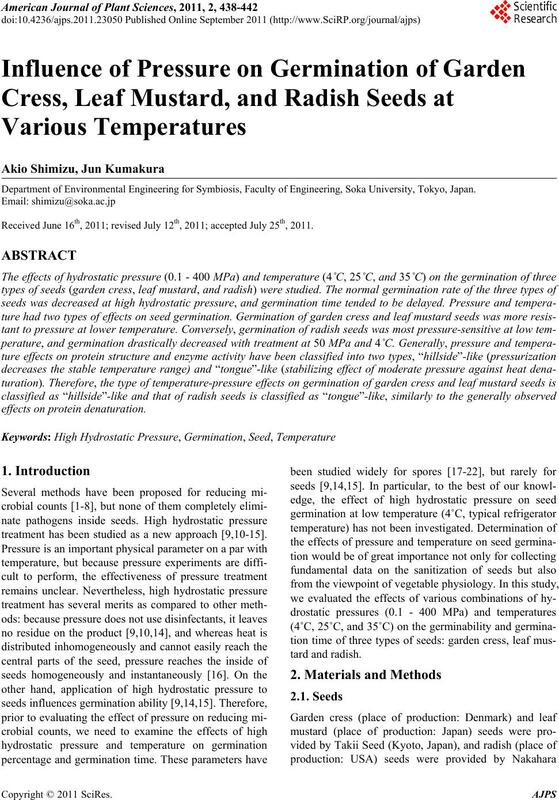 hydrostatic pressure treatment at 4˚C, 25˚C, and 35˚C. 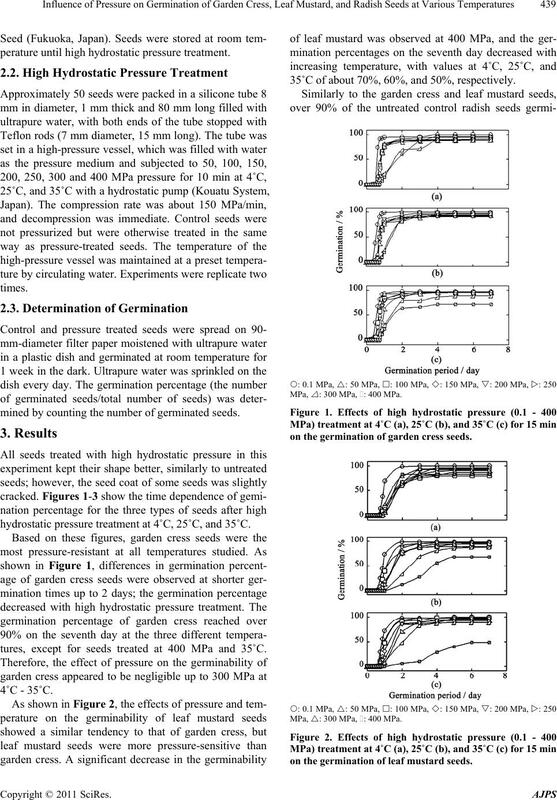 tures, except for seeds treated at 400 MPa and 35˚C. 35˚C of about 70%, 60%, and 50%, respectively. on the germination of garden cress seeds. on the germination of leaf mustard seeds. 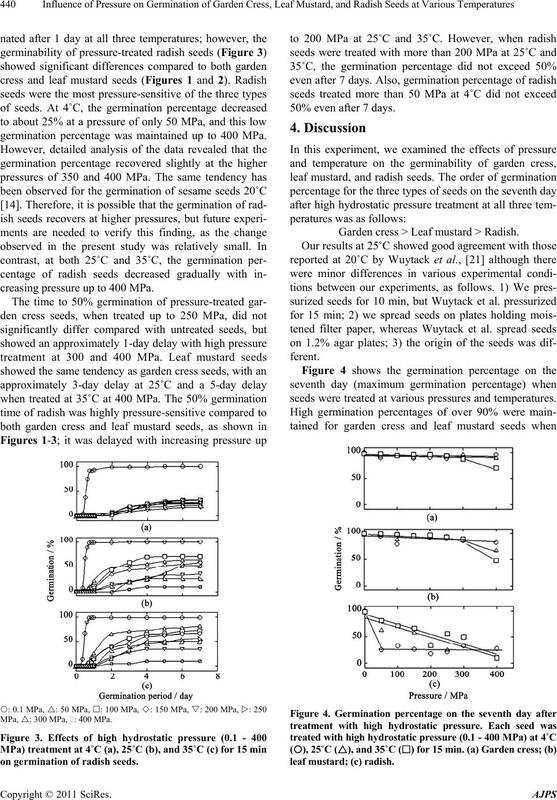 germination percentage was maintained up to 400 MPa. creasing pressure up to 400 MPa. on germination of radish seeds. 50% even after 7 days. Garden cress > Leaf mustard > Radish. seeds were treated at various pressures and temperatures. range of 4˚C - 35˚C. tween the native state and denatured state, is elliptical. and proteins are influenced by pressure treatment. Applied Botany, Vol. 77, No. 5-6, 2003, pp. 152-155. Protection, Vol. 66, No. 2, 2003, pp. 175-181. Food Protection, Vol. 64, No. 2, 2001, pp. 152-154. D. W. Thayer, K. Rajkowsk, G. Boyd, P. Cooke and D. S.
Protection, Vol. 66, No. 2, pp. 175-181. Boetani, S. Abbott, M. E. Beatty, G. Inami and S. B. Protection, Vol. 66, No. 1, 2003, pp. 13-17.
ence and Technology, Vol. 32, No. 1, 1997, pp. 33-39. Journal of Food Protection, Vol. 65, No. 3, 2002, pp. Food Control, Vol. 19, No. 7, 2008, pp. 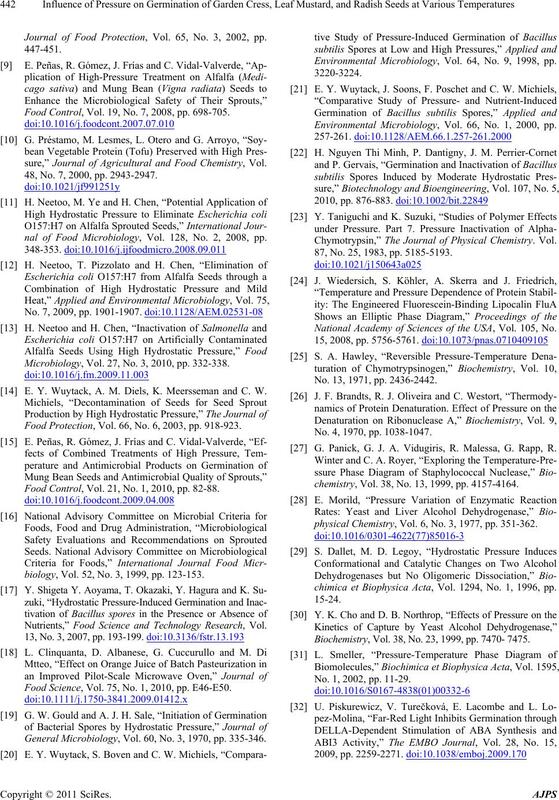 698-705.
sure,” Journal of Agricultural and Food Chemistry, Vol. 48, No. 7, 2000, pp. 2943-2947.
nal of Food Microbiology, Vol. 128, No. 2, 2008, pp. Microbiology, Vol. 27, No. 3, 2010, pp. 332-338. E. Y. Wuytack, A. M. Diels, K. Meersseman and C. W.
Food Protection, Vol. 66, No. 6, 2003, pp. 918-923. Food Control, Vol. 21, No. 1, 2010, pp. 82-88.
biology, Vol. 52, No. 3, 1999, pp. 123-153. Nutrients,” Food Science and Technology Research, Vol. Food Science, Vol. 75, No. 1, 2010, pp. E46-E50. General Microbiology, Vol. 60, No. 3, 1970, pp. 335-346. Environmental Microbiology, Vol. 64, No. 9, 1998, pp. Environmental Microbiology, Vol. 66, No. 1, 2000, pp. 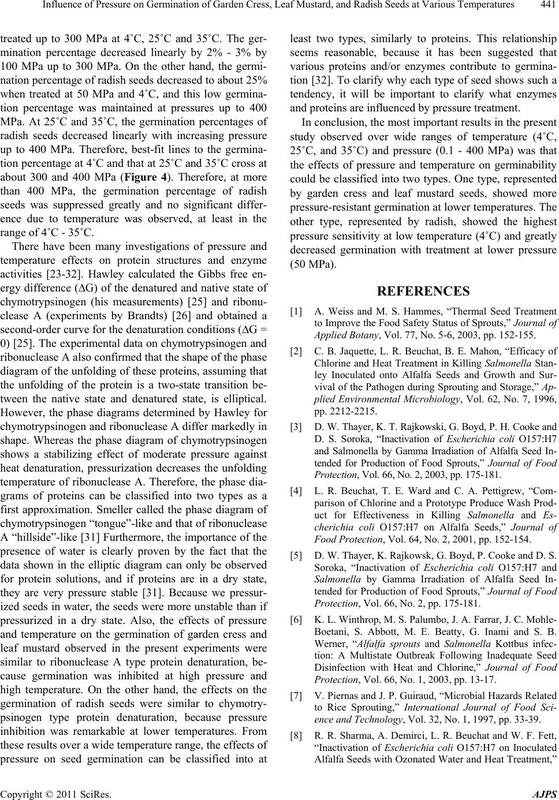 Chymotrypsin,” The Journal of Physical Chemistry. Vol. 87, No. 25, 1983, pp. 5185-5193. National Academy of Sciences of the USA, Vol. 105, No. No. 13, 1971, pp. 2436-2442. No. 4, 1970, pp. 1038-1047. G. Panick, G. J. A. Vidugiris, R. Malessa, G. Rapp, R.
chemistry, Vol. 38, No. 13, 1999, pp. 4157-4164.
physical Chemistry, Vol. 6, No. 3, 1977, pp. 351-362.
chimica et Biophysica Acta, Vol. 1294, No. 1, 1996, pp. Biochemistry, Vol. 38, No. 23, 1999, pp. 7470- 7475. No. 1, 2002, pp. 11-29.